Stadler speaks to 2,000 media representatives and 'influencers' at the A8 unveil in Barcelona. 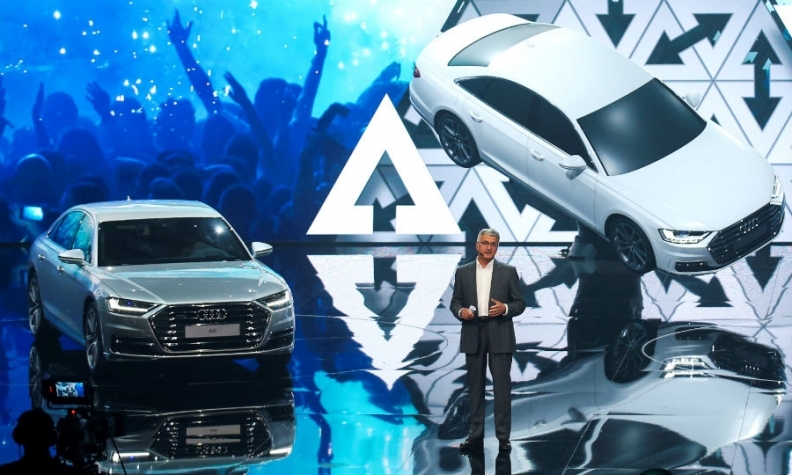 Audi CEO Rupert Stadler has been studying Silicon Valley’s risk-taking culture and with the brand’s new A8 self-driving flagship sedan, he is putting into practice what he has learned. At the 2015 Frankfurt auto show, Stadler admiringly described the difference in business culture between companies in Silicon Valley and Europe. “In Europe everything is forbidden until it is allowed. In America everything is allowed until someone says, ‘It’s a little bit dangerous, so let’s regulate’,” he said. The A8’s optional autonomous function allows the car to start, steer, brake and accelerate by itself in slow-moving traffic on freeways and highways, allowing the driver to do something else instead of drive the car such as watch the on-board TV, Audi says. Germany has passed a law allowing the driver to hand control to the car in certain scenarios, but unless homologation of the technology is approved soon, customers who take delivery of the first new A8s later this year won’t be allowed to make use of the technology. Audi didn’t have a polished answer as to how these early customers will activate the function enabling hands-free driving when it becomes legal, but I guess that’s what happens when you move faster than legislation. This is a company now thinking more like Apple or Tesla than a traditional German firm. Audi unveiled the A8 in Barcelona on July 11 during what it called a "summit." The event felt more like one of Apple’s Worldwide Developers’ Conferences than a traditional car launch.